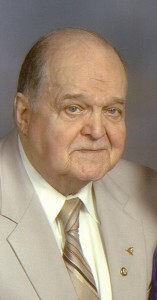 C. Leslie “Les” Thurstin, 87 of Clearfield died on Feb. 5, 2011 at Clearfield Hospital. He was born on November 20, 1923 in Curwensville, a son of the late Clay and Glenna (Shively) Thurstin. Mr. Thurstin was employed in the maintenance department at Penelec, Shawville for 28 years. He was a member of the Curwensville United Methodist Church and a 50 year member of the Free and Accepted Masons, Clearfield Lodge #314. He was a veteran of World War II, and served with the US Army. In addition to his parents, he was preceded in death by his wife, L. Lorraine (Boyle) Thurstin on July 15, 2009 and whom he married Oct. 8, 1942 in Clearfield by Rev. Homer E. Gauntt, two sons William and Kenneth Thurstin, two brothers William and Robert Thurstin and two sisters Mae Drayer and Ruth Autland. Funeral services will be held at the Kevin A. Beardsley Funeral Home, Clearfield on Wednesday at 11 a.m. with Rev. Dr. Robert Ludrowsky officiating. Interment will be in the Oak Hill Cemetery, Curwensville. Friends will be received at the funeral home on Tuesday from 6-8 p.m and on Wednesday from 10-11 a.m.
A Masonic memorial service will be held at the funeral home on Tuesday at 5:45 p.m. The family suggests that memorial contributions be made to Curwensville United Methodist Church Window Fund, 602 State Street, Curwensville.